One of our favorite events isn't in Oklahoma, but it is modern. The White Rock Home Tour is an annual tour showcasing some of Dallas' nicest Mid-Century Modern homes. 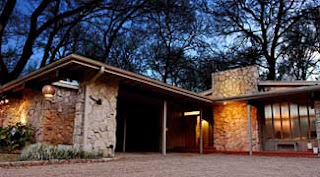 This area is northeast of downtown Dallas, near White Rock Lake, and features ranch-style and minimalist homes from the Fifties and Sixties. Each year the tour highlights 5 or 6 homes, some vintage and some new construction. The weekend also features architectural lectures and exhibits. Proceeds from the event benefit Hexter Elementary, a nearby public school. For 2012 the tour will be held April 21st and 22nd. So mark your calendars, Okies! We'll round up the wagons and make ourselves a convoy. Breaker, breaker. Headin' down to Big D. 10-4.